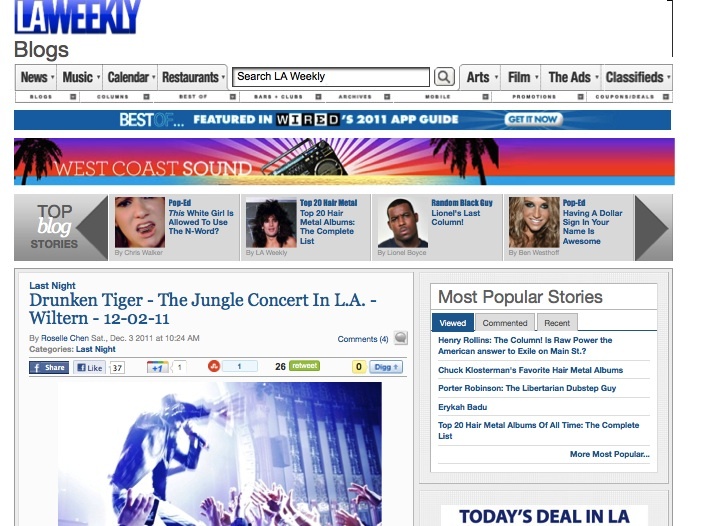 The Jungle Team was on a high last Friday as the day started with JK featured in the daily issue of Los Angeles Times. The artist scored a major win as the acclaimed newspaper called him, “the most popular Korean rapper in America, Asia, and the world.” As the day continued, Jungle had more to celebrate about as fans raved about how great the team performed in their first label wide US concert. The good news did not stop there. The next morning, Pulitzer Prize winning arts paper, LA Weekly, featured a full on review of the show. Loaded with an ensemble of guest appearances (Dumbfoundead, Ann, Styliztik Jones, and Jay Park), it is no wonder Twitter was loaded with “OMG!” comments from concert goers. To read the full review (and see some amazing photography), go to LA Weekly’s blog. Coming Soon: Exclusive photos from the concert.